I’ve noticed over the years that so many of my clients prefer planting schemes with cool colours – white, green, purple, blue, and maybe a dash of pink or dark red. And classy restraint is all well and good but there’s nothing like a big splash of bold and beautiful colour to bring a garden to life and lift the spirits. Here’s a small selection of perennials in vivid hues of reds and oranges for spring and summer. Early in the year nothing provides a splash of colour in the garden to greater effect than a bold planting of tulips. The goblet shaped flowers of Tulipa ‘Abu Hassan’ have velvety petals of a rich deep mahogany-crimson edged with gold. Gloriously vibrant planted en masse, especially amongst lime green Euphorbias, it also matches perfectly with the new red foliage of Photinia ‘Red Robin’. Abu Hassan flowers from mid-April to May on sturdy stems that make it an excellent cut flower. Like all tulips, it needs well drained soil and prefers a sunny to lightly shaded sight. Height: 45cm. 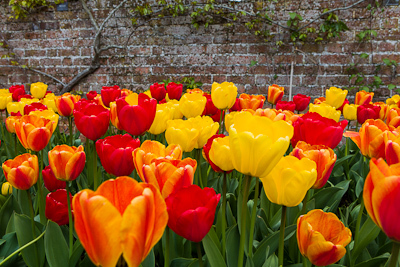 Tulips make very good container plants, especially when several varieties are planted in layers to provide a succession of colour over several months. Garden tips: Plant outdoors from October to December after the cold weather has set in to reduce the risk of viral and fungal diseases. Plant 20cm deep and 8cm apart. Leave all the leaves to die right down after flowering to allow the bulbs to store more food and be at their best the following year. Geums bring the next wave of bright colour to the borders and produce wonderful combinations of form and colour as planting companions for late season tulips. The frilly, fiery orange flowers of Geum chiloense ‘Prinses Juliana’ begin to appear in late April, several weeks earlier than most geums, and are at full throttle in time to provide the perfect foil for the sombre, stately Tulipa ‘Queen of Night’. 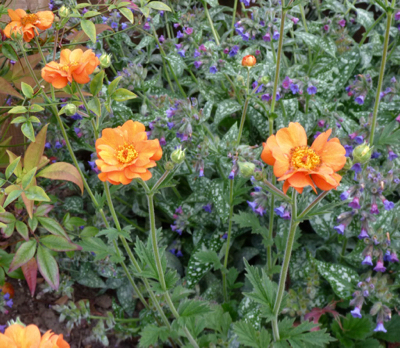 I have noticed that Orange Geums have been a firm favourite in gardens at the Chelsea Flower Show in recent years – and I have to say I find them a welcome antidote to all those very subdued green, white and purple schemes which seem to dominate every year! 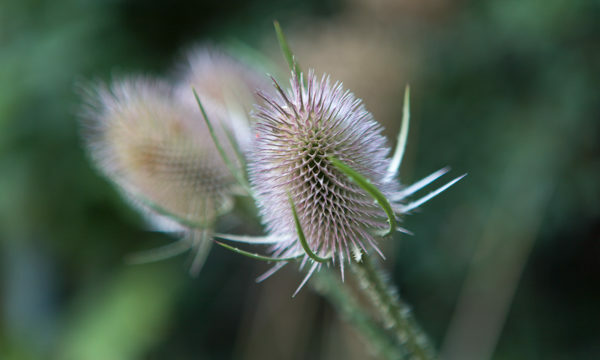 The flowers are supported on strong, wiry stems above neat mounds of deeply puckered mid-green leaves and continue to emerge in succession throughout June and July. These hardy perennials have a height and spread of 60cm x 45cm and are best positioned front of border in full sun to partial shade. They are easy to grow on any fertile, well-drained, moist soil. Probably the biggest and boldest splash of red in the border is made by Papaver ‘Beauty of Livermere’, and it’s a real favourite of mine. This exuberant oriental poppy has sturdy stems that reach 4 to 5 feet in height and its flowers are huge and sumptuous, the dazzling scarlet petals splashed with black at the base and arranged around dark, velvety stamen. 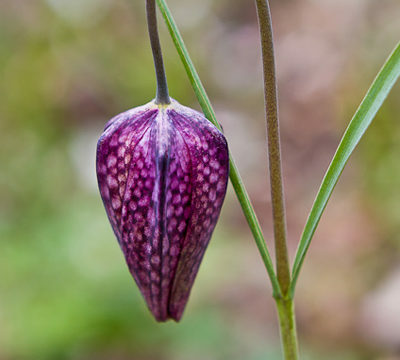 A large part of the pleasure in growing these wonderful flowers comes from anticipating their arrival, spotting the large round buds starting to split and watching as the crumpled petals begin to unfurl. 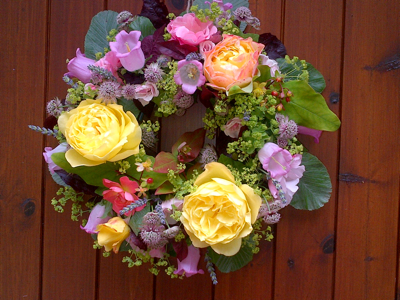 Each flower lasts only briefly (especially in windy weather! 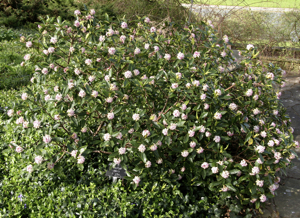 ), but an established clump will produce numerous flowers from late May to the end of June. The basal leaves are downy green and much divided, emerging early in the year to form large clumps. Oriental poppies die back once flowering is over so they are best planted amongst companions that will fill the gap they leave, such as grasses or dahlias. 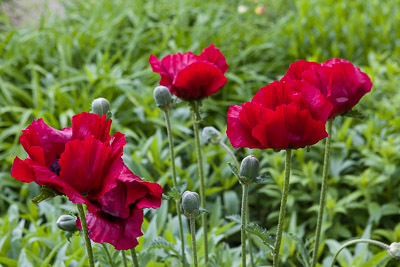 All poppies like an open, sunny site with moist, well-drained soil. 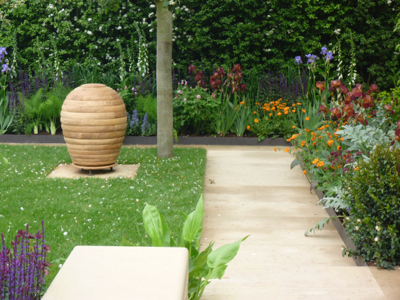 Garden tips: After flowering, cut the untidy looking clumps back to ground level. A new flush of foliage will emerge and may be accompanied by more flowers later in the season. As the poppies fade, the day lilies, or Hemerocallis, start to bloom, bringing warmth and colour to fill the mid-summer lull in flowering. One of the best varieties is Hemerocallis ‘Stafford’ which produces masses of lily-like dark red flowers with yellow throats and midribs that contrast beautifully with its fresh, bright green leaves. It’s an absolute stunner! Each flower lasts only for one day (Hemerocallis comes from the Greek term meaning ‘beautiful for a day’), but there are several buds on each stem and Hemerocallis ‘Stafford’ reliably produces many new stems throughout July. The flowers contrast well with other hot coloured flowers such as Crocosmias or Rudbeckia fulgida and the clumps of strongly arching leaves help to anchor taller perennials such as Echinops ritro and Verbena bonariensis. The young strappy leaves of Hemerocallis emerge early in the year, bringing a zing of lime green to light up the ground between spring flowering bulbs and then quickly forming large clumps which help disguise the fading bulb foliage. They are semi-evergreen in milder areas. Day lilies are easy to grow in any soil, but flowering is prolonged if the soil is kept moist over summer. They thrive in full sun to part shade. Red flowered varieties like ‘Stafford’ fade in intense sunlight, so are best planted in partial shade or where they receive protection from midday sun. 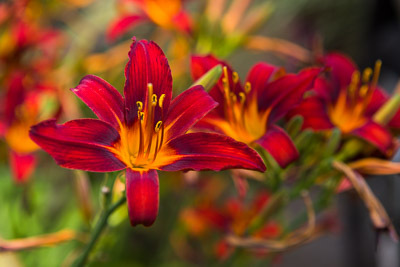 Garden tips: Hemerocallis flowers start to look unsightly as soon as they fade so regular dead heading is needed to keep the plants looking their best and slugs and snails can be a problem. 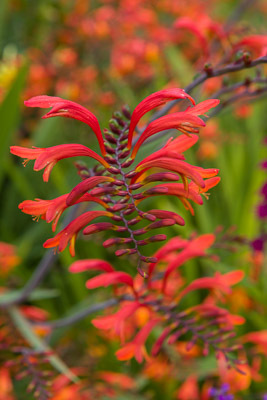 Fiery by name and by nature, Crocosmia ‘Lucifer’ is one of the earliest blooming Crocosmias, starting in mid to late July, and is still setting the garden alight right through August and September. The airy arching stems of flaming red flowers branch out from clumps of large, pleated leaves which are an architectural feature in their own right. It is an imposing presence, reaching 1.2 metres in height and makes maximum impact planted in bold swathes in a sunny or partially shaded site alongside other hot themed perennials such as Heleniums, deep red Dahlias and bright gold Achilleas. For truly show-stopping vibrancy, try combining it with the dark foliage of Dahlia ‘Bishop of Llandaf’ and the lime green bracts of Euphorbia schillingii or palustris. Like all Crocosmias, ‘Lucifer’ will perform best in fertile, moist, humus rich soil in a sunny, sheltered spot (Crocosmias are natives of southern Africa where they grow in damp open areas among grasses and perennial plants in full light). They may need protecting over winter with a layer of bark chip, bracken or straw in colder areas. Garden tips: The secret to keeping Crocosmias flowering well is to rejuvenate clumps by regular division during the dormant season (avoiding frosty conditions). In congested clumps, the rhizomes become starved of nutrients, producing fewer leaves and very few flowers. 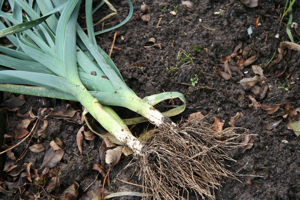 And remember to stake large clumps before they get too tall or they will flop – especially after rain.